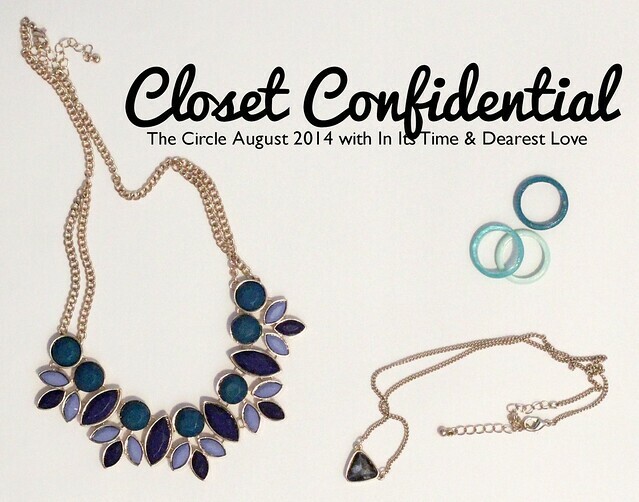 THE CIRCLE AUGUST 2014 | CLOSET CONFIDENTIAL. I'm Jenna and I'm a 2nd grade teacher, and I have a passion for children. Some of my favorite things are early morning lattes, traveling with my husband, and cuddling with my two black kitties. Dearest Love is a lifestyle blog where you will find faith inspired posts, DIYs, wedding photos, recipes, and random musings. 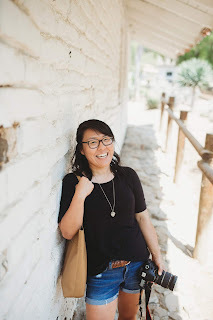 Jenna is not only a sweet blogger, but fellow teacher and fellow Jesus-lover as well. Her blog is a breath of fresh air and she not only writes great posts, but she really cultivates an amazing community on her blog, too. And did I mention how much I love her style posts? She's got the best taste in style and that's one of the reasons why I cannot wait to check out her vlog--you can check out her Closet Confidential post here! Many of you already know what this month's theme is, but in case you haven't heard, this month's theme is all about the Closet Confidential. Jenna and I heard about it through Savannah (of Maiedae)'s vlog and decided to tag ourselves and tag all of you, too. So link-up your vlog or photo-filled posts and let us take a peek into your closet! If you ask me, it's totally a free pass to be a snoop (remember last month's theme?). So if you're a snoop, here's a peek into my closet--with a little vlog from yours truly. The thing I'm holding in my hand the entire time is a shutter remote that I used to start/stop the video on my camera. Of the items still sold in stores, you can find my maxi skirt here, similar boyfriend cardi here, and riding boots here. If you're not sure what questions to answer, I've included the ones we answered. Pick and choose to answer all, some, or add some of your own, too! 1. What's the newest piece in your closet? 2. What's the oldest piece in your closet? 3. What's the least expensive piece in your closet? 4. What's the biggest bargain in your closet? 5. What's the most expensive piece in your closet? 6. What two items are you loving right now? So grab a button, use the hashtag #thecirclelinkup, and add your vlog or blog post below! The link-up is open through the rest of this month so there's plenty of time to join in the fun. p.s. If you'd like to co-host with me, or if you'd like to get email notifications about what each month's topic is/will be, let me know in the comments below! p.p.s. Want to help me choose which glasses to pick? I'd loooove to hear your opinion! And thanks for doing this- because it makes me feel like maybe I really could do a vlog sometime! Those riding boots are gorgeous! And I think that I need to add a maxi skirt to my list of "to buys!" Just a quick question though...what shoes do you wear with maxi skirts?? Is that a dumb question?? sorry! Also- I would LOVE to co-host with you sometime! oh this is SO cute! Linking up with you soon! I want your boots!! and that blue old navy dress is an awesome bargain!!! Loved seeing you on your vlog! You make me smile first thing in the morning. Also... the boys watched some of this because they wanted to "talk to Kiki." Ha! I love maxi skirts too... the only difference compared to sweats or yoga pants is that if you don't shave your legs and wear pants it's still comfortable... not so much with prickly legs under a skirt. Or maybe I should just shave my legs more. Nah. I'm impressed with your video making! I'm not that advanced (or brave) but it was really fun to work through these prompts and to check out everyone else's. That dress looks like a really great buy - flattering and perfect for fall, and $3 to boot?! I've saved to watch later when I'm not at work - YAY!!! can't wait to see your video! i would love to co-host the circle sometime! Yes! I loved it. Totally watched the whole thing. That floral shirt is so cute! I want it. I actually have never even tried on a maxi skirt! Crazy, right? I need to get on the wagon. I haven't had time to make my closet vlog, but I really want to. I love this prompt. So fun! Hopefully I can get to it this weekend. the cardigan! <3 I love it!! and your tye dye tshirt is so cute! I have a few of those myself, some of my favorites! - THOSE BOOTS are gorgeous and look so comfy! Loveeeee love love love love love love! Your voice is just how I imagined--sweet, calm, and teacher-like. Ha! This is the best. I absolutely love your favorites, and I'm definitely going to go search for that maxi! I've been looking for a good one for a while, but they are always too clingy for my bootay. Thank you SO much for inviting me to join you this month. It has been so much fun! It's so cool to hear your voice! It's always fun to put a voice with the face. Also I loved how you did your video! It was soooooo good! I loved this post! I enjoyed hearing the voice behind the blog. I am excited to do mine, hopefully I will have time this weekend! Those boots are so cute, i love them! And you should definitely get a maxi skirt! I just got mine not too long ago so I've been wearing mine with sandals since it's hot out. But honestly, I think a flat or wedge would look cute--although, I'm no style expert. I think it also depends on how tall you are and where the skirt falls. For me, my skirts are nearly floor-length so you can hardly see my feet! Also, I would loooove to co-host with you! I actually need a co-host for next month! Aw, that's so cute that your boys watched it with you! :) We do need to talk again, haha! And I love what you said about shaving your legs. I shave mine wayyyy more only because I have dark hair (TMI, much?). Anyway, maxi skirts are the best. I just ordered another one online and am excited to wear it! Yay!!! I just saw your other comment so I guess you saw it, haha. :) I can't wait to read your post! Aw, thanks! It was all thanks to Youtube, though, so my video-making skills are still pretty much non-existent. :) You should totally make a vlog sometime! And that $3 dress was a crazy bargain. I'm so excited to wear it this fall! Thanks, Robyn! I still can't believe I got that dress for $3, too! And girl, you NEED a maxi skirt. I was scared (weird, right?) to get one but there's no going back now. They're so easy and comfy! I can't wait to see your post! I haven't had a chance to read everyone's yet but I'm super excited to! Anyway, those boots are sooo comfy. They were definitely more than I'd normally pay for a pair of shoes, but totally worth the extra money. I still haven't had a chance to see everyone's posts but I'm sooo excited to! I've been waiting all day now! And thanks! I definitely got inspiration from Savannah (of Maiedae's) mad vlog skills and had some help from Youtube, too! And I hope to see your vlog soon! I haven't had a chance to go through everyone's links yet but I've been wanting to all day now. It looks like we had crazy (good!) timing! That post was definitely fine to include--especially since it was a cute outfit! And yes, I hope you get a chance to join us next month! Another great Circle topic! Congrats on your first vlog girl! You've got guts. :) 1) Love the necklace you're wearing!! 2) Love those comfy Target cardigans! 3) I have an old tie dye shirt that I love... but I definitely wear it out and about. No shame. :) 4) Love that dress--can't believe it was so cheap! I can never find great steals like that at Old Navy! hah yes I need to do another one soon! :) I'm so jealous of your dslr!! and girl sometimes certain items are "worth the price" if you will use them for years to come! I have my eyes on another pair of boots I bought last year, same brand/style/etc that I LOVE and am ready to drop the $50 on them. Me too! It's always nice to people to put a voice to a name. Yeah, it was definitely a splurge to get the DSLR, but I've always wanted the ability to record video. But nonetheless, you neeeeed to record one soon! And I love that you wear your tie-dye out and about! I've worn my around the house but who knows, maybe I'll someday rock it like you do! That necklace is actually from Old Navy (can you tell I frequent that store a lot?) and that dress was a definite lucky find. Normally it's hard for me to find good steals there! Such a fun link up thanks! I love seeing what everyone loves and I also was not brave enough to show my actual closet! groopdealz sells them...i can't remember the name off the top of my head but i would know it if i saw it lol. i'm slowly saving for a new DSLR - i would love to have one when my brother and i go over seas! I love seeing and hearing you! So fun and a fun link up topic. And you inspired me to join in the link up. I said I'd never do a vlog. But it's uploading now. Linking up soon. Eek! I'm so excited to see your vlog and hear your voice! :) I'm so glad you decided to do it. YAY!!! Totally didn't see this comment for some reason, BUT I hope you get to buy that new DSLR! Is there a certain one you're looking at? Hi Katie! I'm so glad you stopped by! I love that The Circle has introduced me to so many other bloggers. :) I can't wait to see your vlog! Oh, and as for co-hosts, I actually have co-hosts lined up until Spring of next year--but I can totally let you know if you're interested in co-hosting then!! Absolutely, I would love to! That is so awesome that you have so many already! Sounds great! Thanks! My email address is kashnerphotography@gmail.com if ya need it! Oh No!! I have my post going live tomorrow and I just realized that the linkup is closed! The next link-up is on Wednesday, September 24th and the topic is on Fall Favorites. If you're interested, I can add you to the sending list to notify you of the topics/dates!